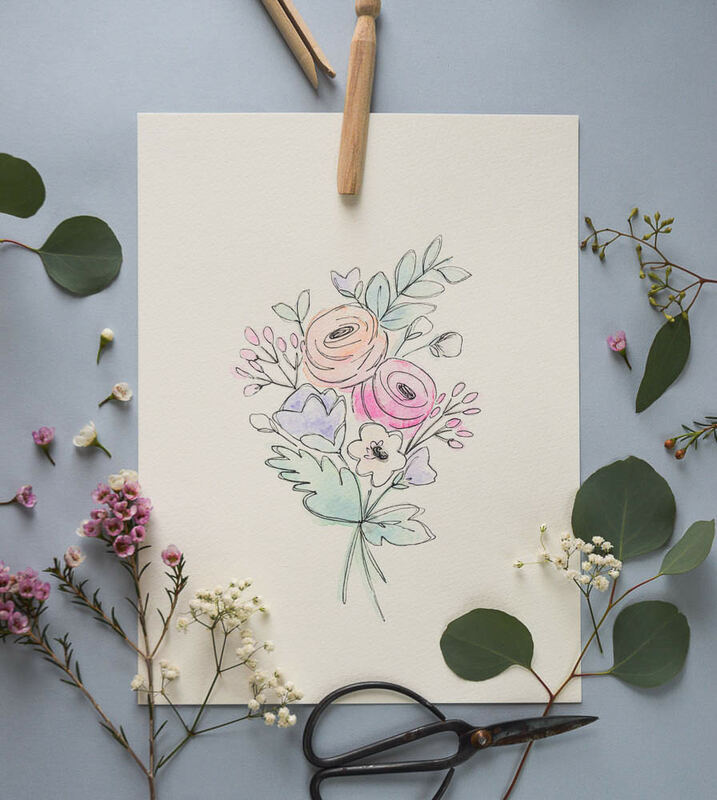 Hello and happy Wednesday! 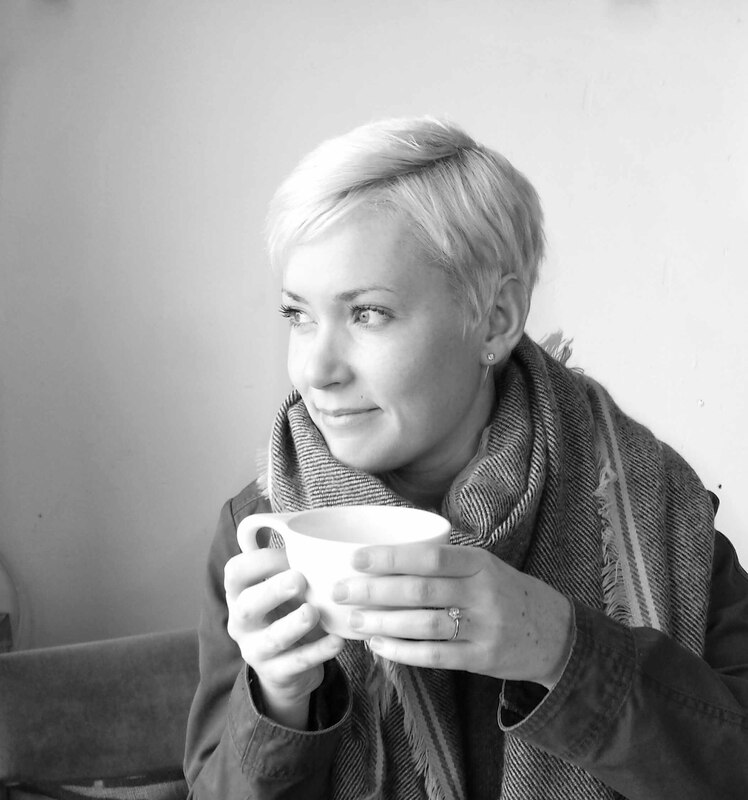 Let me introduce you to the queen of crafts! No, it's not me. 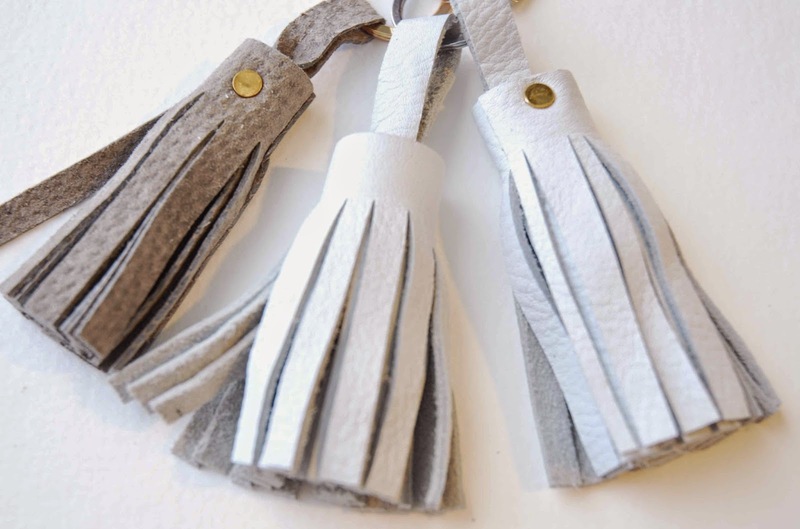 It's these leather tassels! 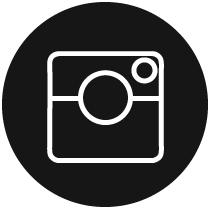 They are easy to make, with a process that quickly becomes wonderfully addictive and the result is a cool, sophisticated leather purse charm or key chain that doesn't look one bit 'crafty'. What more could you ask for? 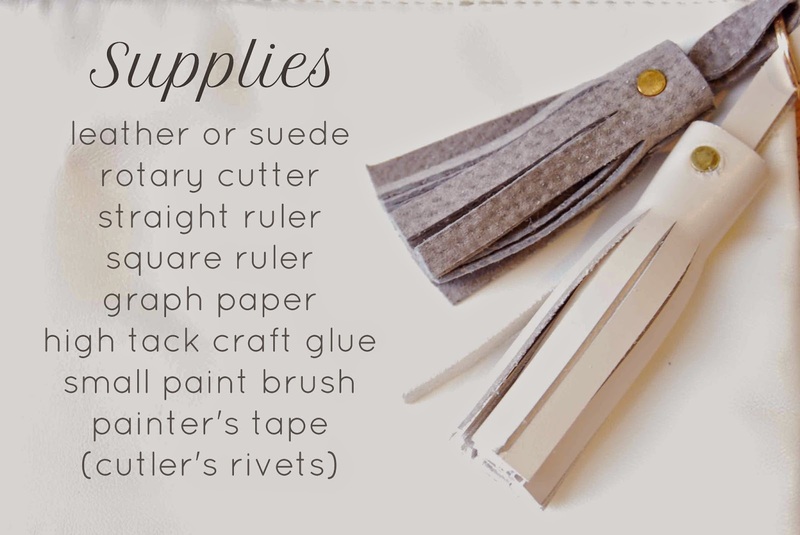 I certainly don't mind telling you I am falling for leather crafts! 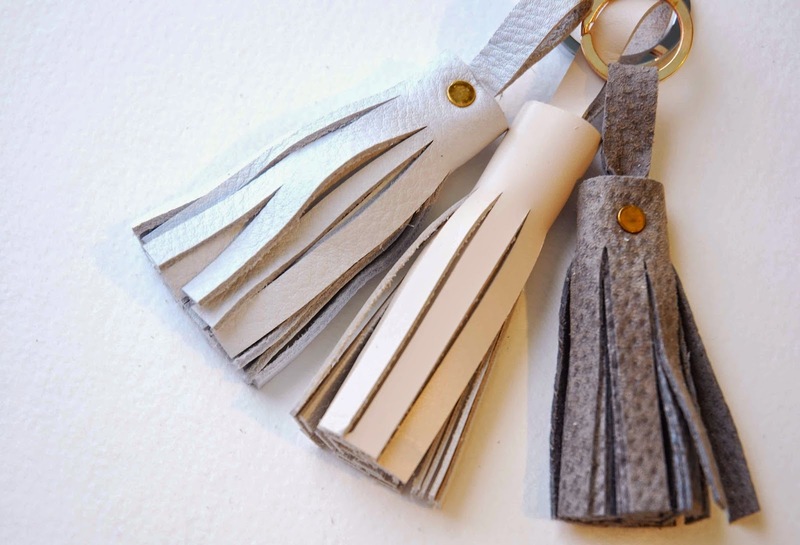 And I hope you'll try your hand at making one or two of these lovely little tassels. I love 'em. I made way too many of 'em. And now I'm gonna show you how I did it! To begin, cut a leather rectangle. 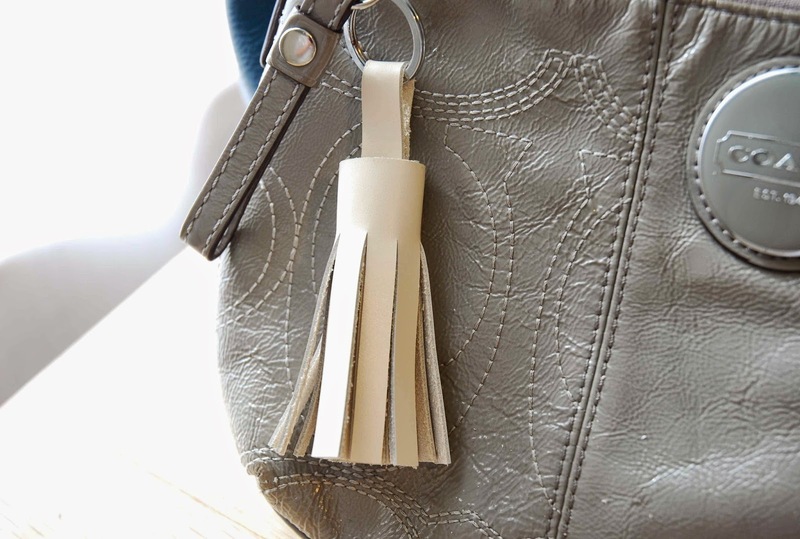 For a key chain tassel a good size is about 7 x 20 cm. 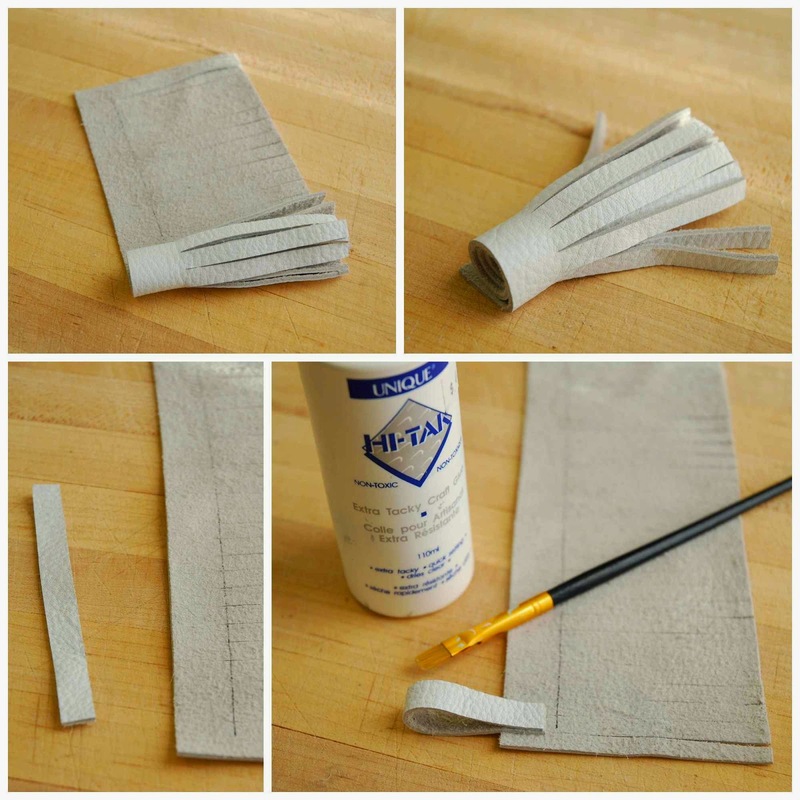 Flip the cut leather over to the rough side and use a pen and ruler to mark out the base (or no-cut) area of the tassel. Set up your work area. 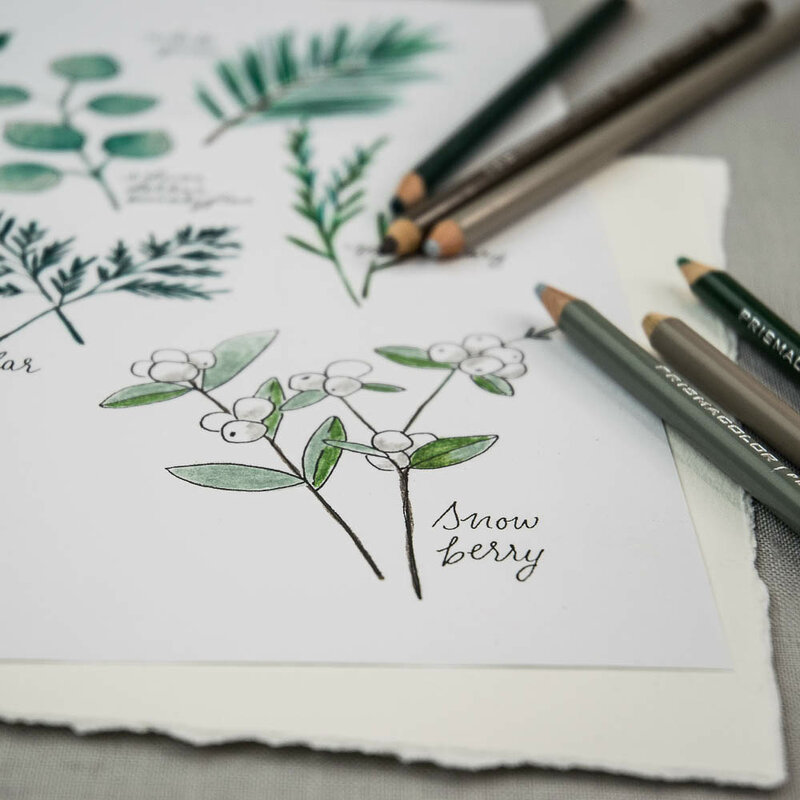 Use a large cutting board or mat as your base. 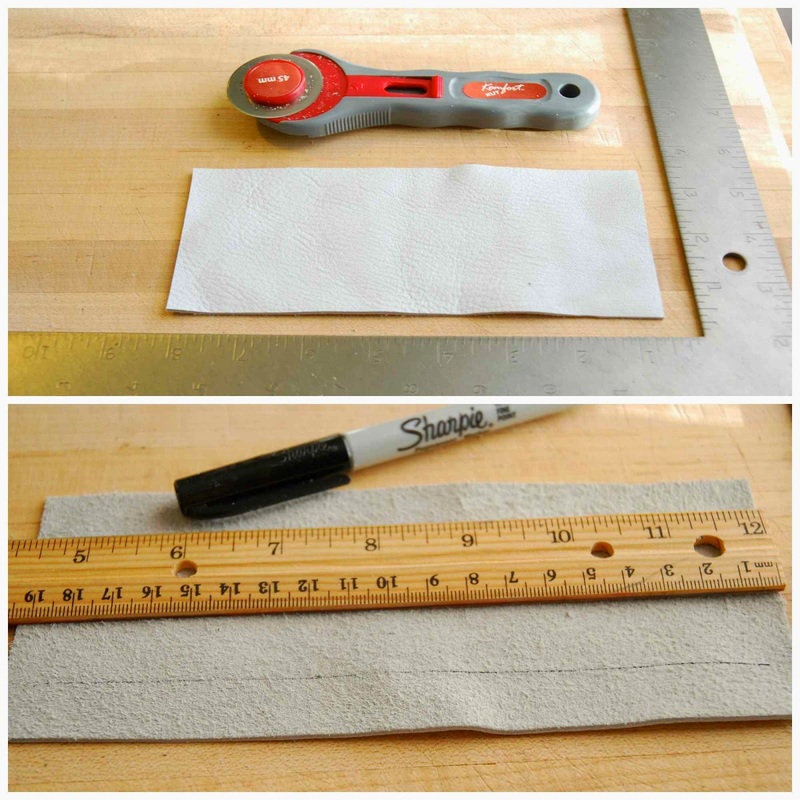 Place leather on top of a sheet of graph paper. Lay ruler over the leather and graph paper. 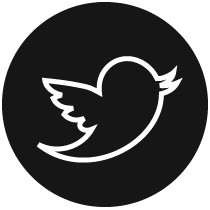 (A heavy ruler is good, and a heavy right angle ruler or square, is even better). 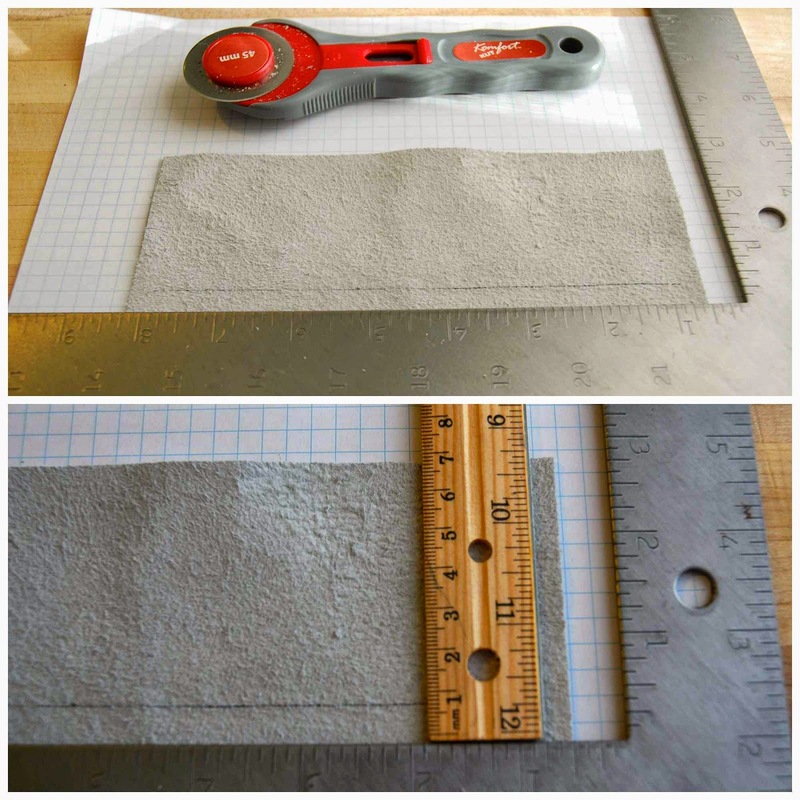 The ruler will help to keep the leather and graph paper in place while you cut. 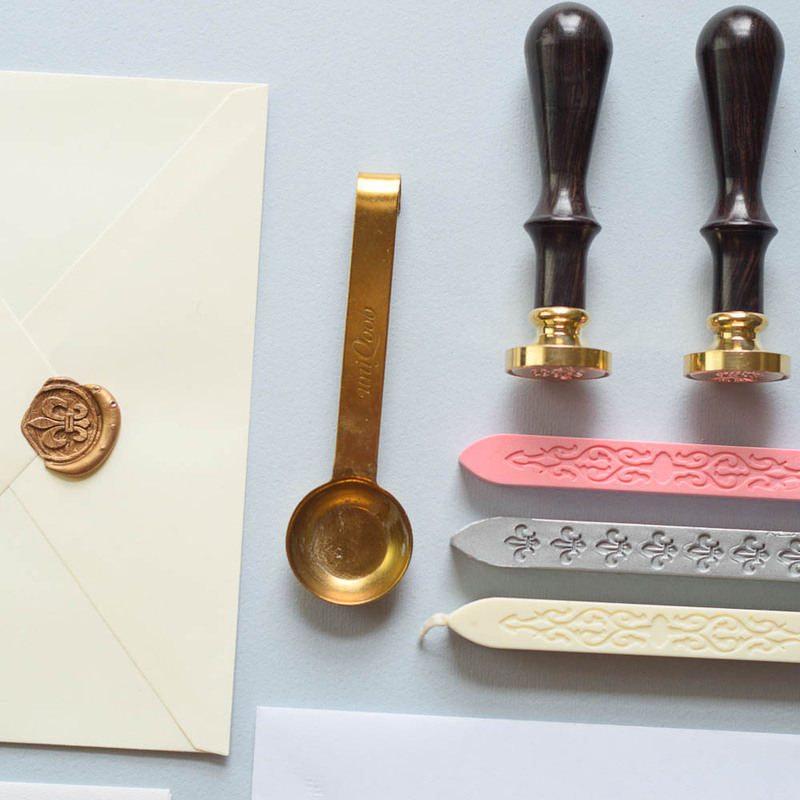 Placing the ruler just below your pen line means it will also serve as a guide for each cut (because your rotary blade will stop in the same place every time). Take your second ruler and, using your graph paper sheet and right angle ruler as guides, line it up for the first cut. 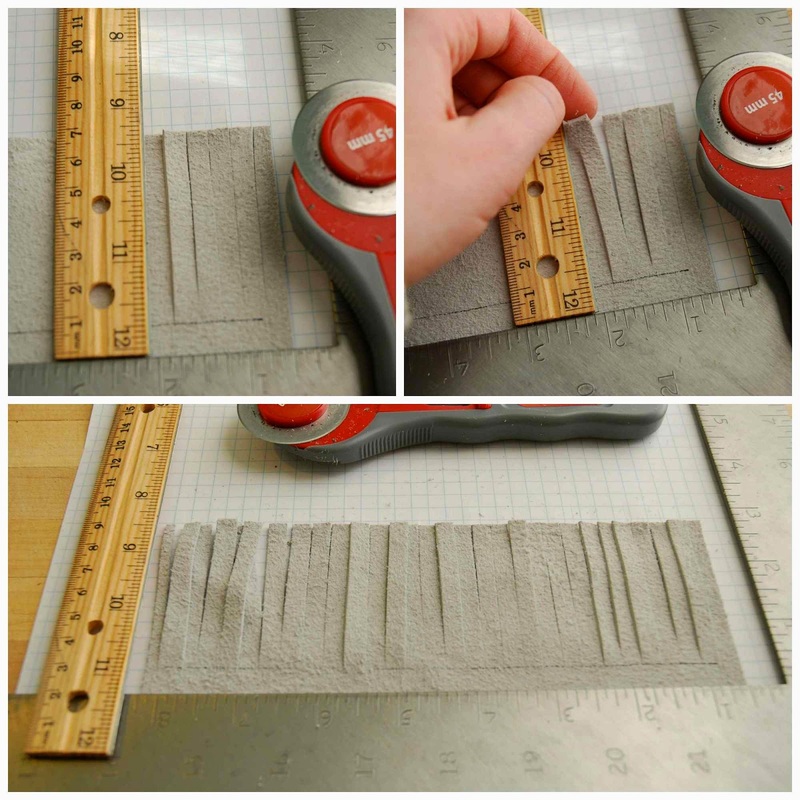 Using the rotary fabric cutter, cut along the ruler edge until the blade touches the right angle ruler. Tug at the cut leather piece to make sure the cut is good. Shift the ruler by one square on the graph paper and cut again. Repeat along the length of the leather rectangle. Once all cuts are made, flip leather over and roll it up to get a preview of your tassel. 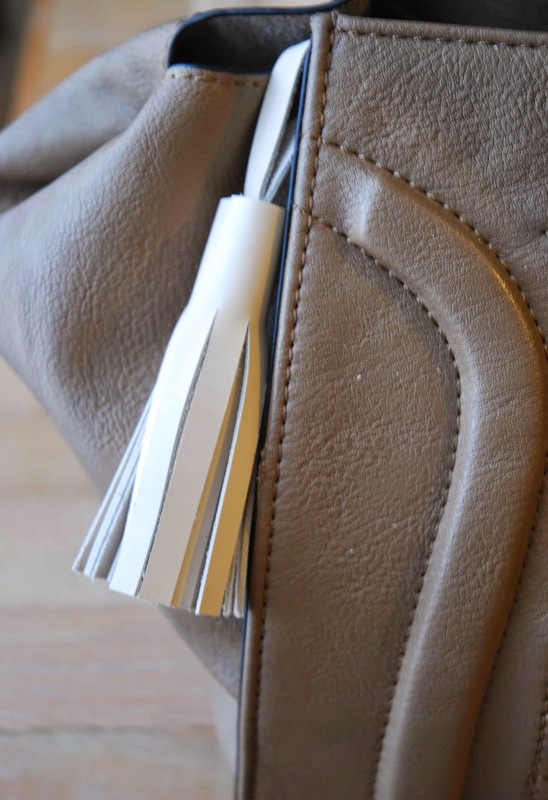 If it looks good, unroll and cut a small length of leather to use as a clasp. 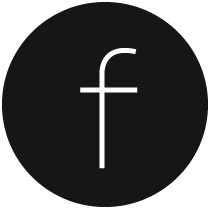 Glue clasp in place with a dot of high tack craft glue or fabric glue. Now it's time to glue the tassel together. Run super tacky glue down the length of the tassel base. Use a small paint brush to spread the glue. Slowly and carefully roll the leather to create the tassel. 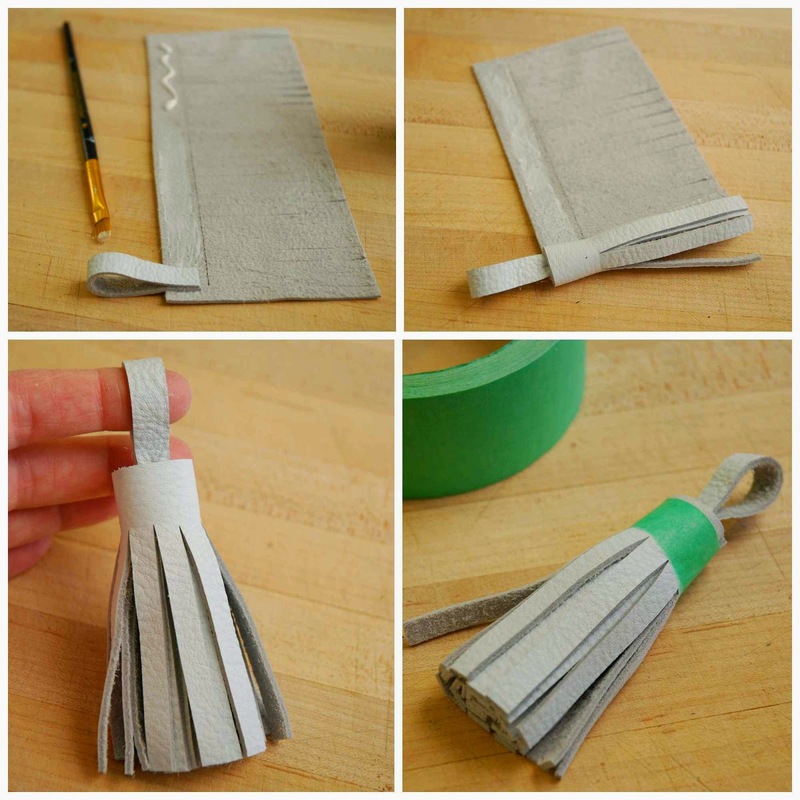 Use painter's tape to hold tassel in place until the glue dries. And that's it! 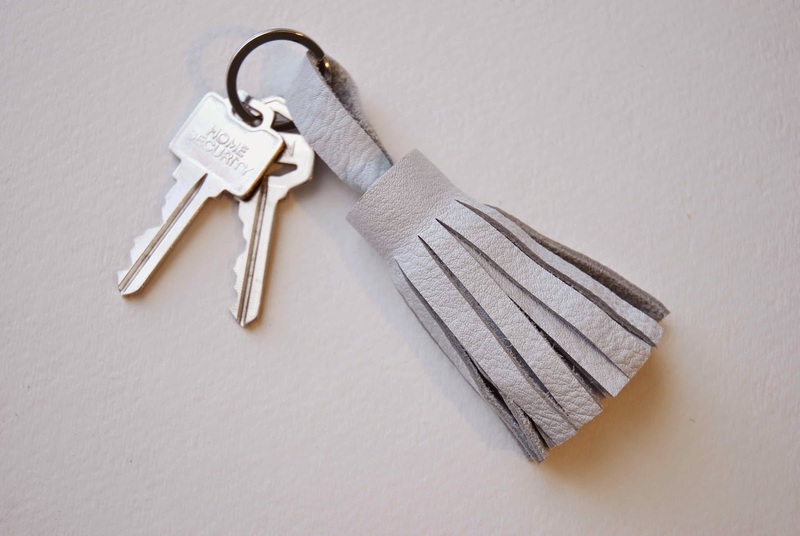 A super cool leather tassel is now yours! Just add a key ring and you're done. But... if you want to go one step further, I'll show you how I used cutler's rivets to take this craft to the next level! 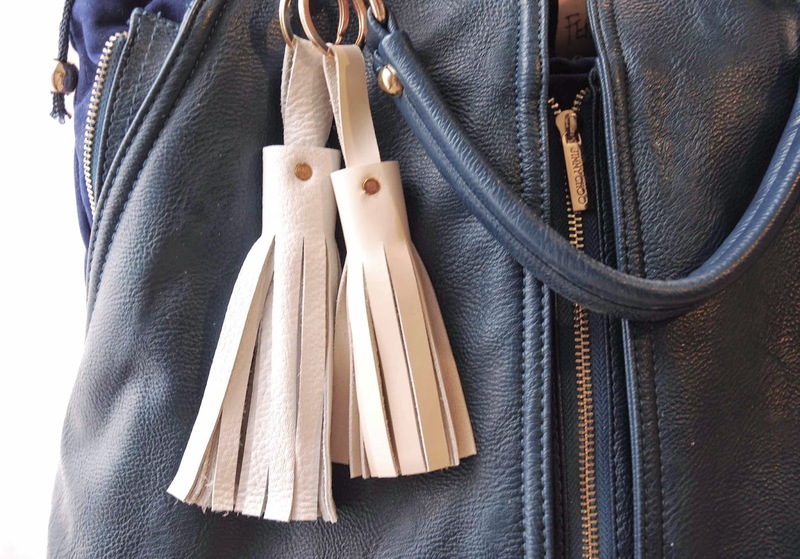 A single rivet will make these leather tassels much more permanent. First you need to drill the hole for your rivet to be placed in. Choose your drill bit (use your rivets as a guide to size), and then get ready to make the hole. Place the tassel on a scrap piece of wood, and hold it down as securely as you can manage. 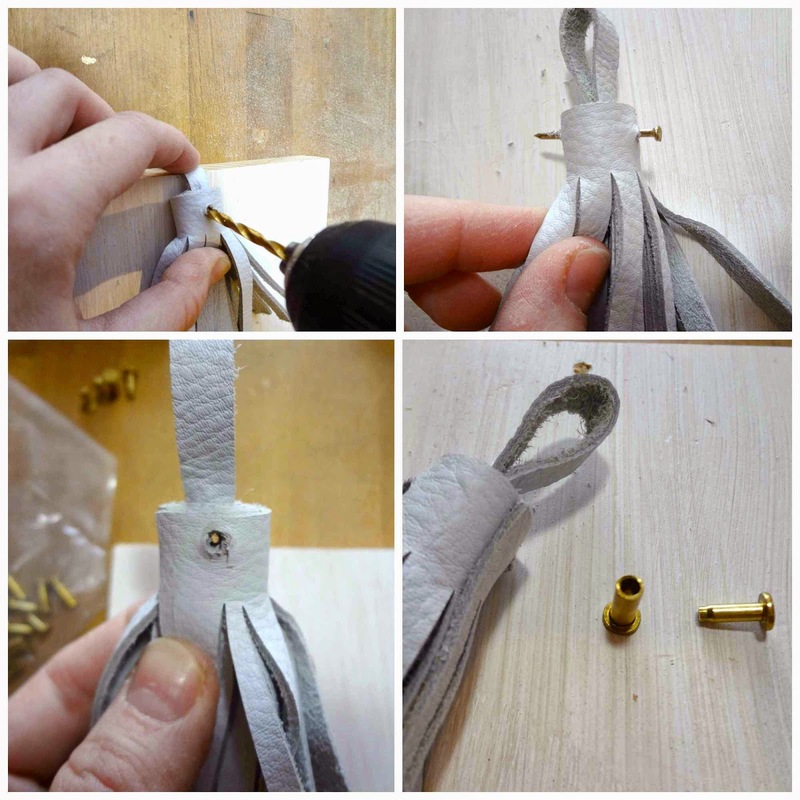 Drill a hole straight through the leather tassel, from front to back. You many want to drill through twice in order to clear the hole. Next, use a nail to continue clearing all the fluff out of the hole. Sticking the nail through will also help you to see how straight (or not straight) your hole is. You can see in the photo that I drilled on a slight angle. It's not a big problem, it's just something to be aware of. For this particular step, a little bit of practice goes along way! Now that the hole is clear, gather your rivet pair (one male part, one female part) and get ready to assemble this thing! Start assembly with the female rivet. Work it into the hole, using a few light taps of the hammer if necessary. 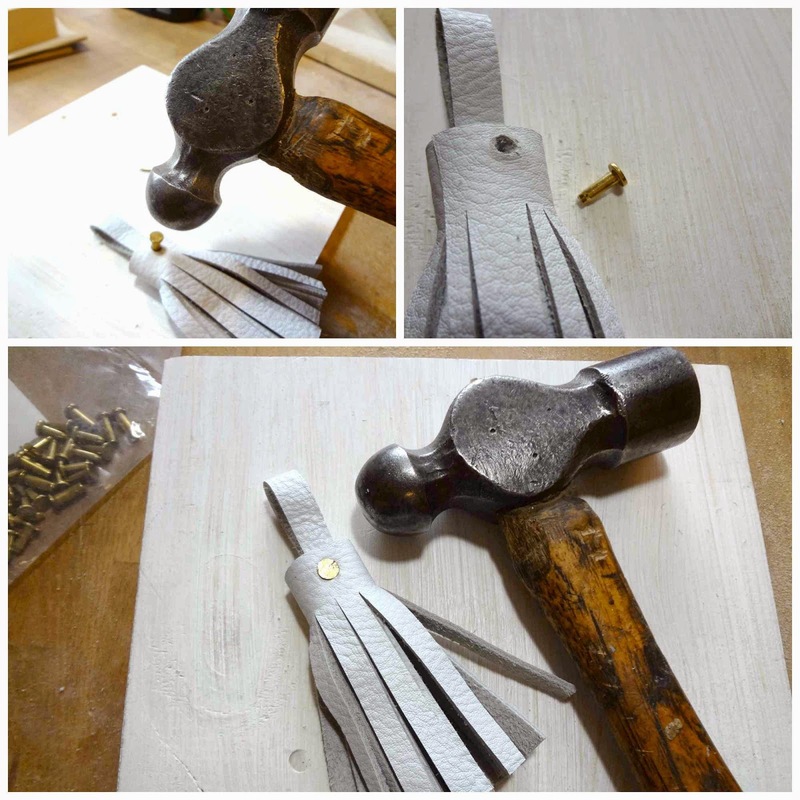 Then flip the tassel over, place the male rivet into the hole, and hammer into place. Ideally it will fit into the female rivet and will catch and lock with a few hard hits of the hammer. However, if you have trouble with this step chances are there is still too much excess leather clogging up the hole. At this point, you may have to remove both male and female rivet parts and continue clearing out the hole with a nail. Important: When bonding the rivet pair, you'll need to place the tassel on a surface which has no give (like a piece of hard, sturdy metal), so that when you are hammering, the rivets have nowhere to go except together! I used a metal clamp as my 'anvil', but you could also use the head of an extra hammer. Once the rivets have bonded, there is no getting them apart! The tassel is not only finished, it's permanent! Tired of reading my wordy instructions? 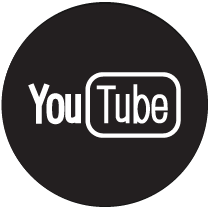 Watch the video and you can listen to them instead! 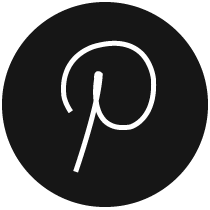 Great Post and beautiful step by step. Question- What size rivets are you using?